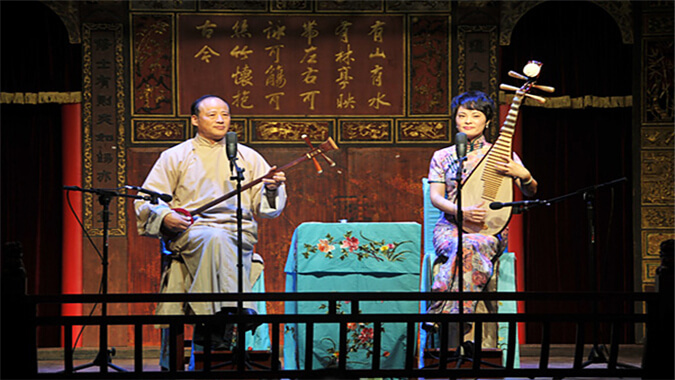 Pingtan, a regional variety of the Shuochang, is an art form which is popular in the south of Jiangsu,the north of Zhejiang and Shanghai. Pingtan, a regional variety of the Shuochang, is an art form which is popular in the south of Jiangsu,the north of Zhejiang and Shanghai. It is a combination of “Pinghua” and “Tanci” which are two forms of Chinese folk art. It dates back to Song Dynasty. It is influenced by the Wu Culture including art, music and literature. Created by the work of the Pingtan artists, this art form enjoys great popularity in Jiangnan. The long history has also laid a solid foundation for its development. Its contents are rich, though the form is simple. “story telling, joke cracking, music playing and aria singing” are the performing techniques, while “reasoning, tastes, unexpectedness, interest and minuteness” are the artistic features. Although it originated in Suzhou, Pingtan flourished in Shanghai with the development of commerce and culture at the turn of the 19th century and 20th century. After that, Pingtan became a new form of performance by innovating and carrying on the tradition. Pingtan forms its own artistic characteristics of reasoning, taste, unexpectedness, interest and minuteness. Reasoning is not the boring preachment given by the performers. On the contrary, it tends to disclose objective laws and essence of real life by means of shaping vivid characters. And the development of the personalities of characters correspond to their circumstances.